Looking for the perfect spot to spend some quality time with family, friends or loved ones? Dancing Waters, located directly on the Cartecay River where fishing, tubing, rafting and kayaking is located right outside your back door. The Cartecay is known for it's rainbow trout so don't forget your pole to try your luck at catching one of these beauties! A large covered porch overlooking the cool rushing waters is an enticement to all that come here. 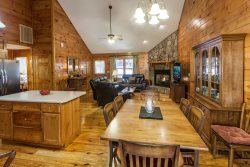 Whether you are enjoying the river from the porch, the dock that overhangs the water or in the water itself, this cabin is sure to become one of your favorite getaways when visiting North Georgia. Beautifully furnished with all the conveniences you could possibly hope for including plush bedding, (5) flat screen TV's throughout the cabin, granite countertops, custom, handcrafted furniture and cabinetry and a great game room with Pool Table, there's something for everybody at this mountain river retreat! And did we mention that you are only 10 minutes from shopping, restaurants and downtown Ellijay allowing you to spend more time at the cabin and less time on the road. Access to the property is easy, 99% paved including the circular driveway so no special vehicle is required to get here. So don't wait, call Mountain Oasis Cabin Rentals today to reserve your spot at this fantastic river cabin! In addition we provide a complimentary start-up supplies of: Toilet Tissue (2 rolls per bathroom), Bar Bath Soap and Shampoo, 1 roll paper towels, 4 kitchen garbage bags, 1 anti-bacterial hand soap for each bath and 1 for kitchen, dishwasher detergent, dishwashing liquid and laundry detergent for at least 2 loads. This was by far the best cabin stay we have had with the number of people in our party. The property gave everyone a space to be in and not on top of each other all the time. Location to town and other sites was awesome and convenient. The river view was amazing!!! We are used to winding through mountains to get to a cabin, so when we arrived we were worried about the view, but we were not disappointed!!! The cabin was clean and the beds were very comfortable. The separate pool table room worked great for our older kids to play while our younger kids napped. The only con I can think of with this cabin is the lack of seclusion I desire when going to the mountains, but the neighboring cabins proved no problem and we loved our stay!!! Very enjoyable! We were there because my son was getting married at a nearby wedding venue. It was perfect for us! Looking forward vacationing with my family at your property when there isn't a pending storm. Everyone was wonderful to deal with from the initial phone call to the follow up calls to extend our stay. The cabin was clean, welcoming, it had everything you needed for a normal stay, and it was also well equipped in the event of a power outage. Customer service was awesome and notified guests on how to prepare for the pending power outage due to IRMA. Great time.. Great Cabin We had a great time and all was set up and well with the cabin. The beds were nice and the living and lounging spaces were good. The hot tub worked well and everything was in order. We played pool and ping pong in the play room and had a blast. We vegged out and watched movies for one entire day. The location was good and tubing was only 1/4 mile away. We went tubing four of the seven days we stayed. We especially enjoyed the hot tub and the ping pong table. The cabin was well equipped and roomy and comfortable. Thanks for a fun time! We really enjoyed our stay at Dancing Waters! It truly exceeded our expectations. From the amenities, to the scenery and tranquility, everything was awesome. Thank you for allowing us to experience a wonderful weekend with our family. Much appreciated! Our stay at Dancing Waters was peaceful and restful. We needed a quiet, tranquil place to spend a couple of days and this cabin proved to be the perfect spot. Dancing Waters is immaculately kept and had everything we needed. We loved the coziness of the decor, the comfortable beds and that the river is right down the back steps. We were grateful that our hosts were able to accommodate our same day reservation.